2. What role does data play in solving that problem? Local markets with the strongest competitive advantage will attract the most employment and hence are the best real estate markets. Data is essential to understanding what is driving that competitiveness and what employment areas are growing or shrinking. Demand for property is based on employment, income and growth so the better you understand how, why and where things are changing the better chance you have of maximizing deal timing, value and yield. Essentially it comes down to getting the deeper insights needed to maximize opportunity. 3. Who are you disrupting? Esri compliments other data providers and data site like Bureau of Labor Statistics, Census, Xceligent, CoStar, etc. We provide access to thousands of demographic and economic variables that helps commercial real estate professionals better understand supply and demand and therefor opportunity. 4. Where does your data come from? We aggregate data the many different authoritative private and public sources like the Census Bureau, Infogroup, Directory of Major Malls. 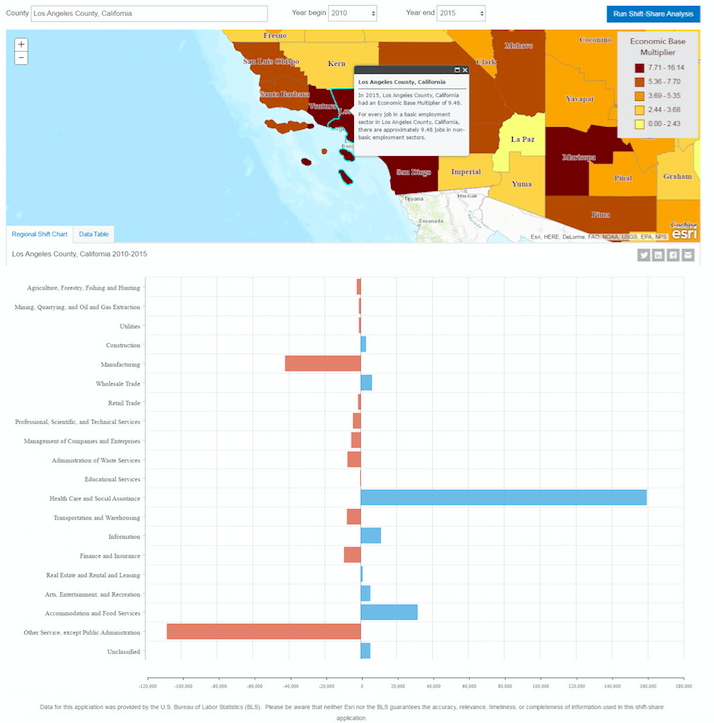 Esri has data on everything from demographics to consumer spending, market potential to traffic counts, business and shopping center locations to crime statistics. There are over 7,000 variables at every scale of geography from state to census block group that you can combined however you want. You can mix and match from any of these categories and perform complex analysis between them to look at correlations and trends. 5. On the ownership of data and fear of giving it up: Why should I give you my data? Esri licenses its data and makes it available online to users and subscribers. Other users like local, state and national governments and commercial suppliers publish data to the same cloud-based content library, known as ArcGIS Online, and make it freely available. There are millions of maps and data layers on hundreds of thousands of subject. All under a creative common or commercial use license. No user created or contributed data is harvested by Esri and all data remains the property of the user. Providing government entities provide access to data so they can meet mandated transparency requirements and enable greater insights into local markets. Open data is increasingly becoming popular with commercial organizations especially in an aggregated and anonymized form. Providing access to this data helps identify local information that is vital to better decision making. When people share with other in the community this information is more valuable and more up to date. The insights we can gain by multiple people sharing data is huge. It’s a virtuous cycle that benefits everyone. 6. How does access to more data change the workflow for the industry? More data doesn’t need to change the workflow but what is does is change how you think about a deal. Data and analytics tend to make you ask new question or question some of your assumptions. You spot things that you’ve never seen and learn things you didn’t know. This helps you ask new questions which leads to new discovery and thinking about opportunities. It allows you to quickly rule out some deals and pencil in others. Once you’ve started to zero in on a deal analytics improves understanding of the nuances of the deal. It often helps you validate your ideas for highest and best use, show new angles or help you overcome objections the client has. 7. What is the future of data in commercial real estate? Where do you see things going? Analytics is being easier and data is become more assessable. There will be disruption of the traditional model for accessing real estate data as the cost to value equation for users change. Crowdsourcing and open data are growing exponentially – it’s another influence of the shared economy – and this continue to grow. Once you do a deal why keep it hidden or share it just with someone else who is going to resell the information you gave them for free? Communities of user are growing who want to share their deals and pipelines with others and work more collaboratively. Rather than paying thousands for access to a small market people are seeing that they can collaborate and work anywhere from anywhere. This is going to change how people think about the services they are paying for and bring about new business models and new market entrants. Using shift-share analysis quickly understand your market’s competitive strengths and trends in local employment by comparing regional insight with national and industry sector changes. Are you attending CCIM Thrive? If so, Visit the Esri booth during Thrive to discover game-changing, industry-specific analytical tools and workflows, like the following, that can help you and your organization stand out in customer spotting, nearest facility, map tours, marketing flyers and much more. For more information on Esri solutions for commercial real estate visit esri.com/realestate.